Monster Gem: Puzzle Shooter now available on Google Play! Get ready for a unique action-packed, fun-filled adventure! Immerse yourself in a fantasy world of cute and wild creatures in this colorful mix of RPG and bubble-shooting puzzle all rolled into one awesome game! Challenge your skills as you defeat and catch all monsters in 7 different islands in Monster Gem: Puzzle Shooter. Explore 7 unique islands that hold different types of monsters and try to survive the adventure! Fight your way through for a chance to capture fantastical creatures straight into your pocket. 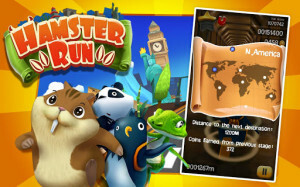 Explore all the islands and collect all monsters to become the best monster tamer! Collect your little Pet Monsters to defeat your opponent! Play Monster Gem Island today! Download the game on Google Play, FREE! Run as fast as you can around the majestic Madagascar rain forests to escape from danger in Hamster Run, Happy Mage’s newest entry for Android. 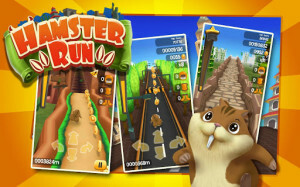 Hamster Run is a FREE, high-octane running game that will push your skills to the limit. 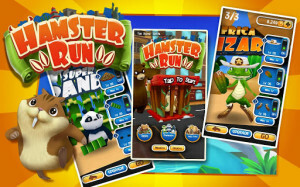 Test your persistence, speed and agility, guiding our furry hero as he jumps, slides under obstacles and sprints away from the voracious grizzly bear and into safety. Collect coins along the way to acquire gear and power-ups that will give our little hamster the edge needed to escape the jaws of death. Hamster Run is now available for FREE on Google Play!